This is what we'd do. Friends, this post is one of pure Oxfordian revelry, a bit of a Christmas treat to get you dreaming about a ramble round this dreamy old city. I've lived here over three years and when I pound the cobbles at dusk or in the early, autumn mornings, I often still feel the same in-drawn breath of joy. This city, with its cobbled lanes and golden-stoned nooks is a wonder of a place on earth (to use a Wendell Berryan term). It livens the sight and sparks the imagination. I know that a delight in this city is something I share with many of you, and in the past couple of years I have received countless emails asking for details of my favorite Oxford activities and haunts as you planned your own adventures. So, I thought that on this freezing Tuesday I'd have a little fun and dream up the tour I'd take you on if we had two days in Oxford. You can find lists and links of all the places, cafes, colleges, or restaurants described below at the end of the post (with a few extras added). I hope this brings a bit of fun and brightness to your day! The morning would probably be chill, we would no doubt be scarved and booted as we began, with the sun just beginning to warm the old stone walls. 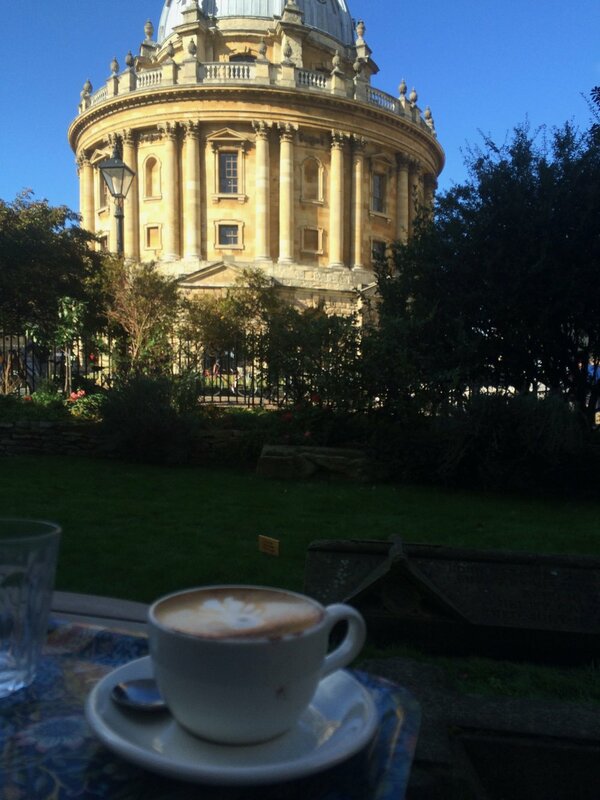 We'd start with breakfast right down in the heart of Oxford at the 'Vaults and Gardens' cafe of University Church, from whose pulpit Cranmer was taken to die (the spot marked by a large black X in Broad Street) and C.S. Lewis preached his famous Weight of Glory sermon. Our official touring would begin with a climb to the top of the old church tower for a bird's eye view of the Oxford spires. But let us not start our adventure on empty stomachs! As any good hobbit knows, quests ought to open with at least a big pot of breakfast tea, some version of eggs, and I would add a big old Vaults & Gardens scone with as much cream as we could slather topped by homemade jam. Only then could we have enough energy to mount the narrow stone steps and soak in the glory of the (very possibly grey) morning. From that splendid height, we'd look straight down upon the Radcliffe Camera, the iconic round building of the Bodleian Library (whose sea-green and sky-lighted upper galleries are my favorite study spot), and the courtyards of the further reading rooms beyond, our next destination. The Rad Cam is off limits to visitors, but the larger library gives fascinating tours of other parts of the complex maze of reading rooms and vaulted spaces. These are worth every penny. I've lived in Oxford for 4 years and I'd still go on one for the sheer historical insight, though I'd be sure to choose the one which included a glimpse of the Duke Humphrey room, one of the oldest in Oxford, with massive old manuscripts and eerie stained glass windows (the setting for the 'forbidden section' in the first Harry Potter film, if you are so interested). After a peek into the Bodleian gift shops (they have such fun, bookish treasures), we'd head up to Broad Street for a ramble round the famed Blackwell's Books, Oxford's best-beloved and immense old bookshop. From there, we'd go for a slight shopping and college detour down Turl Street, one of my favorite walkways, and I think, one of the most picturesque streets in Oxford. There, we'd pop into the Oxfam bookshop and hunt for a few used classics, we'd visit Scriptum, a stationary and curiosity shop whose leather-bound books, fountain pens, marionettes in the window, and be-wreathed British nobility always make me feel I've stumbled into a shop run by a good fairy where portals open upon small, mysterious worlds. We might visit the shoe shop where Lewis bought his shoes, or look at the 'sub fusc' in vogue (as if it ever changes) in Walter's. We'd also sit in the window of the Missing Bean for some of the best coffee in Oxford if we needed a jolt of energy. While on Turl St., we also might peek into Exeter College (Tolkien's college, incidentally) if we were in an academic mood. It's a compact gem of a college hidden behind a massive old oak door in the golden-walled heart of the city. 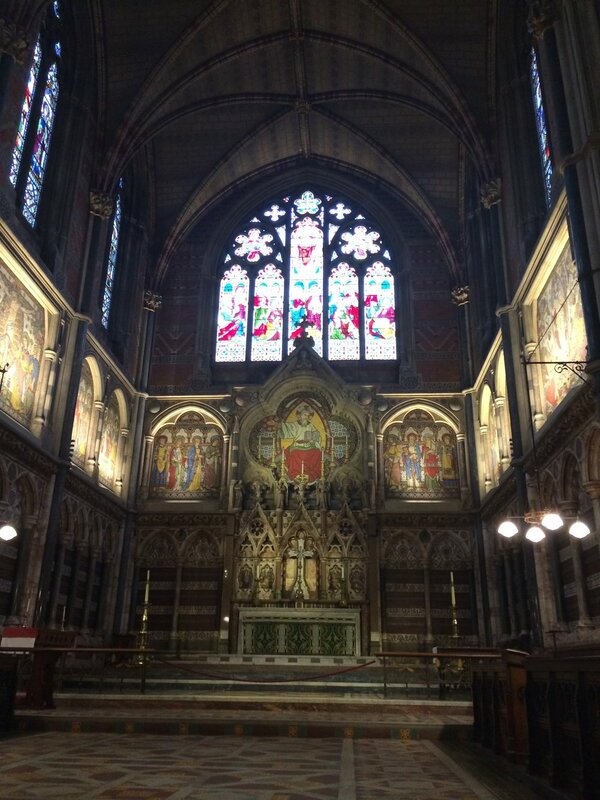 It's chapel was modelled after Sainte-Chapelle in Paris, and it proudly houses a Burne-Jones tapestry of the nativity amidst a splendor of stained glass windows and soaring lines very distinct from its sister Oxford college chapels. Its quad is a model of Oxford's ivied walls, neat gardens, and passageways to...who knows where. Narnia, perhaps? The fellow's garden, if open, is splendid, a serene space with a unique outlook onto the roof of the Rad Cam (a rather good place for picnics. Lunch, and our afternoon ramble, would take us into the Covered Market, where we'd sit down to a traditional British hot lunch of pie and mash (and probably mushy peas with gravy) at Pieminster, a little shop in the heart of a market where butchers and grocers, bakers and cheesemakers still ply their lovely trades amidst local cafes and curiosity shops. Thus sustained, we'd set out for our serious college touring, though we might have to choose between the mighty; Magdalene or Christ Church? Both are splendid, but let's choose Christ Church today and save Magdalene for the C.S. Lewisian morrow. Christ Church is one of the old grand dames of Oxford, the seat of the diocese' cathedral, with grounds stretching straight down to the river. It's classic Oxford college and we will take the full tour, marveling at the gigantic dining hall, the majestic quad under 'Tom Tower', the cathedral, the art galleries, and the pastoral serenity of a ramble in Christ Church meadows. If we were dying for a pre-dinner cuppa, we might then walk out through the gardens back onto St. Aldate's St., where we'd order a nibble at Cafe Loco, an Alice in Wonderland themed tea shop with excellent scones and cakes. We might pop our heads in next door to the all-things-Alice curiosity shop as well as St. Philip's Books, a shop whose speciality stock is theology (from church fathers to the present) and Inklings studies of all kinds. We might end up with a first edition if we're not careful. From there, let us ramble to The Kilns, Lewis' famed Oxford home, shared with his brother, nestled in a still countryish feeling corner of Headington in what used to be open countryside. We can catch a taxi or a bus, (and we'll definitely have booked our tour in advance), but once we are there, we can slow our pace to enter the workaday world of home and hearth that fed and warmed the mind behind Narnia. The presence of those famed stories lingers in every room as we explore the great old wardrobe, the kitchen still outfitted with the aga, the study with splendid collections of Lewisian books, Lewis' small bedroom and the tiny porch from which he gazed out upon the stars (and gained inspiration for his cosmic trilogy). We ask our tour guide loads of questions and finish by leaving the house for a ramble round the pond and nature reserve just behind The Kilns. Should we happen to feel like sitting in profound contemplation, or taking a space to journal, this presents an excellent opportunity. To close our Headington jaunt, we head to the local Anglican church where Lewis worshipped regularly, listening for the echoes of his voice at morning prayer as we admire the stained-glass 'Narnia window'. For lunch we'll head back to Oxford, only to be faced with a difficult choice. We can either wend our way to the lively Gloucester Green market (on Wednesdays, Thursdays, and Saturdays), where the cuisines of the world gather in a stunning display of little booths whose lunchtime delicacies are all priced at 5 pounds or less (I highly recommend the Greek). Or, we might find a shop on High Street where we can stock up for a little picnic (we still have afternoon tea to face! ); a baguette, some cheese, a bit of fresh fruit, some cider, just enough to sustain us for the next adventure: our ramble round Magdalene College, Lewis' own academic haunt where he hammered wisdom into the heads of students and had long talks with Tolkien and the other brilliant fellows of the Inklings. This is probably my favorite Oxford college; every corner is rich in carved beauty, the cloisters are dappled with quiet light, the chapel is both awe-full and intimate. We would note the red geraniums in the windows of 'New Building', marking the rooms Lewis used for tutorials and friends. And we'd got for a matchless wander down Addison's Walk, the old path shaded by great trees under whose windy boughs Lewis and Tolkien had the talk about myth shifted Lewis' heart toward the possibility of Christ as the living, 'true myth' behind all our great stories. If we turn to the left as we go in the gate, we'll see a little bridge and stone wall before the first turn with a round plaque inscribed with the words of Lewis' poem What the Bird Said Early in the Year. We would definitely stop to savor it and see what the birds were saying then. Having walked off lunch in the dappled realms of Magdalene, we would go in search of high tea; though this is not particularly Lewisian, it is very English (which Lewis decidedly was), so I would include it as a necessary element to an Oxford visit. The Randolph is always a possibility though I've never tried it myself. It is a splurge of a thing, with miles of food and a price to match, but it is the classic Oxford high tea, and you are served in high wingback chairs under tall windows, with roses leaning gracefully over your china teacup. The Old Parsonage perhaps my best beloved, the elegant, intimate spot (with excellent sandwiches and tea in pewter pots) to which one I have taken many friends to before. For this moment though, we'll wander across the street from the Randolph and seat ourselves at the rooftop cafe of the Ashmolean Museum. With a bird's eye view of the city and the near blue hills and a decent high tea, we can savor the scones and sandwiches, then head down for a wander through Oxford's art and history (the museum is free). Sated with tea, let us set off for that splendid Oxford tradition, not to be missed, a college evensong. Magdalene and Merton are my favorites, though New College and Keble (whose side chapel houses William Holman Hunt's magnificent painting The Light of the World) are splendid as well. New and Magdalene boast their own famed boy's choirs, while Merton has a matching marvel of a girl's choir. 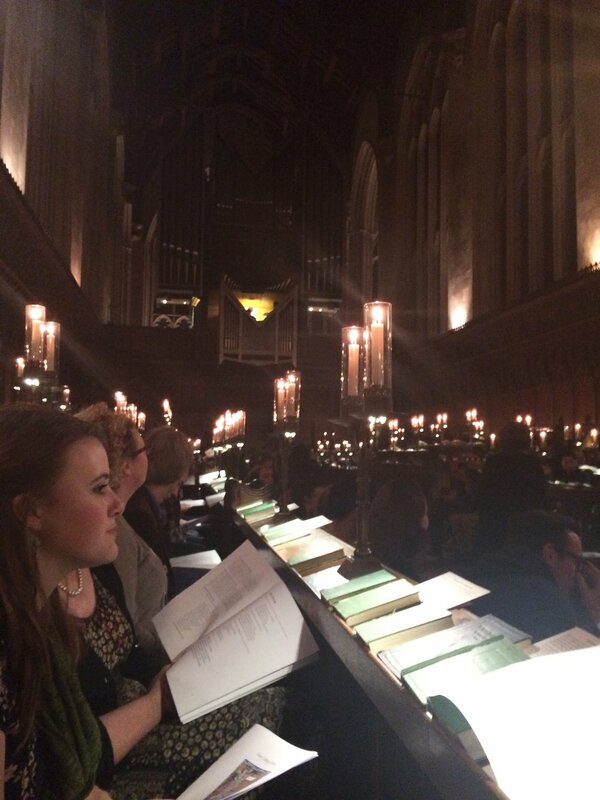 The music, the Magnifcants and anthems, the chanted psalms by candlelight, are an experience integral to life in Oxford, something still precious to me however many times I've attended. We'll finish just in time to high tail it to The Eagle and Child pub, better known as 'The Bird 'n Baby', famed as the gathering place of the Inklings. I'd recommend the fish 'n chips, and we could even eat in The Rabbit Room, the actual space in which the Inklings met, nicely outfitted with Lewisian portraits and quotes lest you miss the fact. In keeping with tradition, we shall debate some aspect of Norse mythology, or one of us might also be forced to read aloud from his or her latest written work. If its a Tuesday (and if I'm planning, it will be), we'll then head next door to the beautiful Pusey House, (whose chapel, history, and marvellous Tractarian library deserve an exploration of their own) whose upper Hood Room hosts the weekly meeting of the Oxford University C.S. Lewis Society. Here, we will be treated to a paper or contemplation on some aspect of literature, history, art, or philosophy connected with the work of the evenings. There will be time for questions, and a good bit of lively discussion, and the conversation might move just across the street to the Lamb and Flag pub, whose selection of drinks is, I am told, quite excellent, and which some of the Inklings actually preferred. There, we can chat imagination into the wee sma's. Or, if we feel contemplative and quiet in heart after a day of such beauty, we can just head down the steps from the Hood Room into the hushed, shadowed corridors of the Pusey Chapel where a candlelit, chanted compline is waiting to ready us for grateful, sated sleep.